Wireless gaming products are almost non-existent. This is because gamers always seek for near zero-latency experiences. Wireless transmission does give the impression of poor quality and delayed signals, even though wireless products brings about many practical benefits. Typically for console gamers with their setup in the living room, it’s difficult to connect a wired headset to the console without the use of cable extenders. Furthermore, such setups create unnecessarily messy cables across the living room. 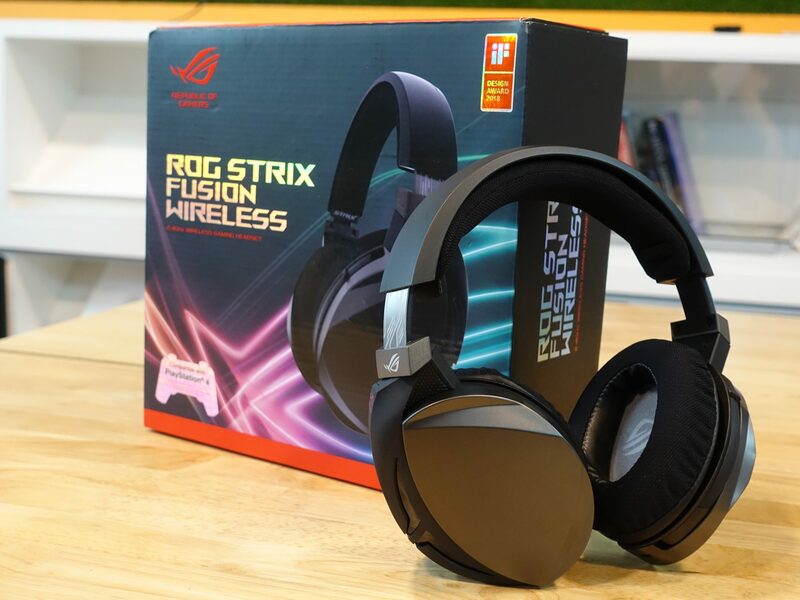 To tackle this problem, the ASUS ROG team came up with the ROG STRIX FUSION Wireless Gaming Headset to provide a seamless wireless connection to your console. Not to mention, it is possible to game without the wires and cables attached. The main question arises: How well will this headset perform? Will there be any lag? How will it sound? We will answer these questions in this review. Rather than a flashier style adopted by previous version STRIX Gaming Headsets, the ROG STRIX FUSION Wireless kept things simpler. Its ear cups are cut in a certain way to showcase a certain sophistication of geometry to the overall design. These cups can also be folded inwards for easier storage as well. The headband is also retractable and can be adjusted to the individual’s head size. The overall build is sturdy, and we do not expect that the material will break under pressure. Also, there is a soft cushion padding at the head band area, which makes the headset extremely comfortable to wear. The stock set of ear cushions are specially engineered to enhance the overall user experience on the headset. They are known as the ROG Hybrid ear cushions, which are said to deliver better sound insulation, ergonomics and comfort. On top of this, a set of leather ear cushions are also included in the package. The whole headset only comes with a single button – the power button. To keep things minimal, instead of physical buttons on the headset, ASUS designed the ROG STRIX FUSION Wireless headset to respond to touch controls instead. To change tracks, simply swipe left or right. To play or pause the music, just tap on the ear cups. You can also control the volume by swiping up and down on the ear cup! Additionally, the microphone of this headset is also cleverly hidden within the headset itself. Users can simply flip it out from the left ear cup. The microphone unit is also flexible, and can be adjusted accordingly to comfort. To fully utilize the features of the headset, users can download the Armoury II software from the ASUS website. With the software, both the playback and recording features of the headset can be tweaked. For audio playback, there is a sound optimization option that the users can set to cater to different scenarios. ASUS has preconfigured profiles, such as Communications, Flat, FPS, Gaming, Movie, Music, Racing or RPG, to adapt the headset to different audio requirements. If these presets are not good enough, further tweaking can be done via the equalizer as well. The software can also enable the virtual surround feature, which tries to simulate a 7.1 audio experience through the stereo headset. On top of that, there are also additional features such as Bass Boost and Voice Clarity. Moving on to the recording end, the Armoury II software can also reduce the noise level coming from the mic, or improve the quality of the voice input. Firstly, we have to mention that audio experience is largely subjective to individuals. Just solely focusing on music of the Pop, Rock and Rap genre, the Music Sound Optimization profile worked well. With the Bass Boost function turned on, we were able to get that extra depth and impact on lows. Overall, the whole headset is well balanced across all the frequencies, where the highs are clear, mids are succinct and lows are defined. This brings about a superb audio experience which many gaming focused earphones lacked. When it comes to competitive gaming, there are 2 main goals that gaming headsets aim to achieve – hearing and being heard clearly. In terms of hearing your teammates’ voices clearly, these headsets tend to be on the brighter side of the audio spectrum. This is due to them being tuned to pick up voices more clearly over the gunshots and explosions happening concurrently in games. Unsurprisingly, the FUSION works as such and does it well. Most of the games’ audio can be heard, but is not the main focus and stays in your peripheral hearing. The aforementioned Armoury II software allows users to tune the microphone’s sensitivity to background noise, and isolates the user’s voice. On the other hand, even without any tuning, the inward-facing mic is able to is able focus on the user’s speech in a typical gaming environment. With that said, it would still pick up the clicks and clacks from fans and noisy keyboards (e.g. Cherry MX Blue switches), but the noise stays in the background and is not overpoweringly loud. The ROG STRIX FUSION Wireless headset is able to adapt to different user scenarios effectively. When the mic is not in use, it can be hidden into the unit itself, transforming it into a capable high-quality headphone for daily use. Thanks to its padded hybrid ear cushions and headband, it was also extremely comfortable as well. The only drawback is that the device is not compatible with smartphones. I connected the USB dongle directly to a smartphone via USB OTG, but I was only able to get sound coming out from the headset on one side of the earphone. Else, the added gesture-based touch media controls will make this headset a great general consumer gadget as well. The battery life was also great, as it was able to last through a full day without recharging. Honestly, there isn’t much to complain when it comes to general usage of the ROG STRIX FUSION Wireless headset. The ROG STRIX Fusion Wireless headset is capable. It brings about great audio quality regardless of the usage scenario, be it in games or general entertainment use. It has effectively changed our mindset of the limitations of wireless headsets, as it was able to perform up to par, if not better, than usual wired headsets. If you are looking for a new pair of wireless gaming headsets for your PC, the ASUS ROG STRIX FUSION Wireless Gaming headset is worth your considerations.